version and that, and creating a clean, cohesive whole." "I want to echo Beth's sentiments - we are GREATLY appreciative of the fantastic job you did, and SO FAST! "It immediately came in handy, as a current prospective client went on yesterday and saw the Corporate Training Page and fell in love with the WORKSUITE offerings!! We haven't closed the sale yet, but having that page up really sparked his interest and imagination on what we could do together. "I finished looking at the edits I sent to you except for that last word 'useful' and everything looks good to go. All links checked out from what I can tell. PDF files work great and look to be in a good place and systematic. "As soon as you are ready, do your thing, make 'er live. "Thanks for everything so far. GREAT JOB!!! Hope I wasn't your worst nightmare." "Wow. That was quick. Thank you!!! From the way you sounded this afternoon, I figured it would be till the middle of next week at the soonest. I guess when you're good, you're good. "So, many thanks again. It was, as always, a great pleasure working with you again. Talk to you soon and take care." In the summer of 2000, after having been laid off from what would be my last administrative assistant job, I had a career epiphany. I realized that I needed to change careers (I've always had a creative bent). The prospect of ending up in another cubicle working as a clerical scullion doing mundane busy-work just didn’t appeal to me. Adding to that, my extensive background in insurance licensing had priced me out of lower-level clerical positions – jobs I really didn’t want anyway. What to do? Return to my penchant for graphic design, with an emphasis on web development, of course. I had been building and maintaining personal websites since 1996, writing straight HTML code and utilizing WYSIWYG web editing software. I just needed to ‘fill in the blanks’ of what I didn’t know and refine what I did know. And I needed to learn graphics software: Photoshop, Fireworks, Illustrator et al. I also switched from FrontPage to Dreamweaver – which was quite a transition. 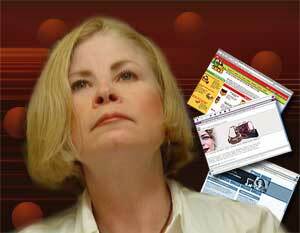 I’ve now been designing websites professionally since 2002. I have also taught Dreamweaver to San Diego Community College District faculty and staff at the Learning Resource Center at San Diego City College. I have also run Dreamweaver workshops at the same location. 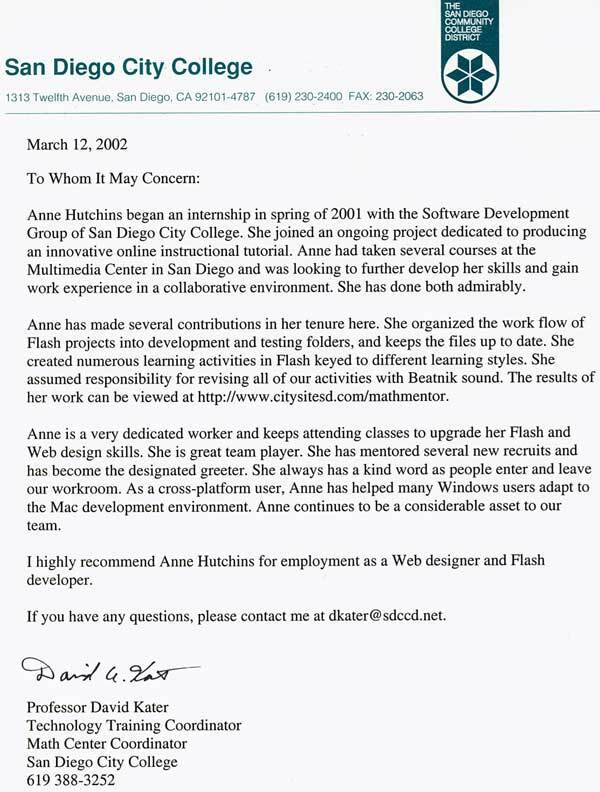 As an intern, I participated in developing math tutorial software (using Flash) at San Diego City College for their Math Mentor program, eventually earning a paying contract for that work. (A letter of recommendation from Professor David Kater, Math Center Coordinator, can be viewed here.) I currently work as an independent contractor for a design/development firm, Harris Media in New York City, designing, redesigning and maintaining many of their client sites. Even though I'm based in San Diego, I'm used to working remotely with clients. Many of Harris Media's clients are all over the U.S. I've worked with clients in New York, New Jersey, New Hampshire, Wisconsin, Florida, Pennsylvania and more (one client lives in Greece). Of course, I'm always looking for more firms to work with as a sub-contractor. Unlike many web developers, I don't mind performing website edits, no matter how tedious. On the writing side of things: I began my first online journal in 2000. Blogger was in its infancy then; we put our thoughts on the web ‘old school’ by creating a template from scratch, then formatting each ‘post’ without the convenience of a Dashboard. I closed the journal in 2002 after I began building websites professionally. I previously built personal websites as a hobby, beginning in 1996, when the web was a toddler. The old journal has since migrated to several different servers in the last thirteen years, but now lives on an undisclosed server. I currently maintain one blog, scammersuncovered.com. My writer's portfolio can be found at annehutchins.com.